Eclipsed moon with star. Taken with Astro-Physics 155edfs/ Nikon D1x digital SLR on 08 November 2003. Alan Friedman. I'm a "luna"tic, I admit it - and March is going to be a great month. 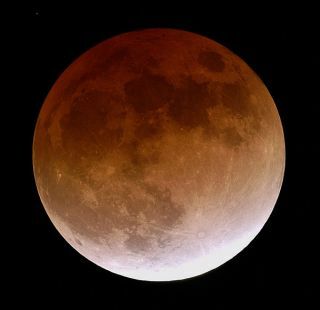 It opens with a bang - a total lunar eclipse on the evening of March 3. This will be a glorious show for North Americans who will see the moon rise above the eastern horizon shaded in the rusty hues of totality. A great photo opportunity with a repeat performance on August 28 (in case you miss it.) But this is just the beginning. March marks the end of winter for the northern hemisphere (a cause for celebration in Buffalo!). A reminder of the coming spring often catches me by surprise on the ride home from work - a waxing crescent moon riding high on the ecliptic. Edged in brilliant sunshine with the lunar night lit softly by sunlight reflected off the earth, it's a harbinger of spring, a sign that the season of endless clouds is coming to an end. The time has come to shake the dust off the telescope and camera. To my eye this is the moon in its most photogenic phase. Venus will join the waxing crescent this year, forming a close conjunction in each lunation through July. This dramatic sight, a symbol of meaning to many cultures, is a great subject to capture with your camera. If you are new to astro-photography, there is no better place to get your feet wet than on the moon. Moonlit landscapes have inspired artists from Ansel Adams to Van Gogh. Lunar images can be captured with any camera and within any budget. Its brightness permits short exposures. Much work can be done from a steady tripod without the need for a tracking mount. As you gain skills and deepen your interest you might be tempted to zoom in for a closer look. At high magnification, the moon becomes a much more temperamental subject. We'll talk more about high resolution lunar imaging next month. I hope you find clear skies on the evening of March 3. If you are viewing from the Americas, be sure your observation site offers a good view of the eastern horizon. This is where the action will be. A lunar eclipse can be recorded in many different ways. By taking multiple exposures spaced at regular time intervals, a tripod mounted digital camera can record the progress of the moon's path as it emerges from the earth's shadow, moving through a full lunation cycle in a matter of hours. A wide angle or normal lens can be used. The moon will be a small disk set against the landscape (a half millimeter circle in a 50mm camera lens). With the stationary landforms used for registration, computer software will allow you cut and paste the moons accurately to create a dramatic digital montage. Fred Espenak's article on shooting a lunar eclipse was written in the days of film photography, but it remains a great resource for this and other techniques. To create a closer portrait displaying lunar features you will need to shoot at a longer focal length, using either a long telephoto camera lens or a telescope. If you have a digital point and shoot camera with a fixed lens, you can shoot afocally by holding the camera to the eyepiece of a telescope. Special adapters can be purchased to mount the camera for this application - a good choice if you plan to do more than a casual shot or two. If you have a digital SLR, a mating T-ring and nosepiece can replace the lens, allowing you to mount the camera body directly into the focuser in place of an eyepiece. The telescope becomes a super telephoto lens. At this focal length you can capture the features of the full lunar phase - dark maria and brilliant ejecta trails from the moon's newest craters - all tinted burgundy from the ring of sunrises and sunsets refracted into the earth's shadow. A fifth magnitude star in Leo will emerge from behind the darkened moon around 1:12 UT (8:12 EST) - see if you can catch it. A full moon surrounded by stars is one of the photo opportunities unique to a total eclipse.